The largest supermarket chain in Finland, Kesko, now has sustainable work wear for their employees. "IN SUMMER 2017 WE WILL GO ONE STEP BEYOND IN OUR CORPORATE RESPONSIBILITY." Neutral® is more than clothing. It's designed as a communication platform for you to inspire people and business to act okay. All Neutral® products come with Certified Responsibility™ labeling and hangtags, making a clear statement about their inherent qualities. That way, Neutral® exemplifies your commitment to the health of people and planet. Organizations increasingly replace our front hangtag with one of their own, or take a step further by customizing our products according to their specific sustainable message. Either way, with Neutral® you can share your inspirational stories with great impact on a T-shirt you need anyway. And that's okay! Check out some okay cases below. The Danish singer Gulddreng ("Goldboy") has since his first release in 2016 had success with his self-mocking songs about luxury, gold and fame, sarcastically referring to the music business. For the AW17 Copenhagen Fashion Week, he relaunched himself as Grøndreng ("Greenboy") together with Altivisten, promoting sustainable clothing consumption through ecolabels. With the Blæredygtig Neutral® T-shirt, referring to a combination of the words "sustainable" and "showing off" in Danish, they found a way to share their inspirational story with great impact. A simple, but strong message. We work with Swedish Kolmården - the largest wildlife and amusement park in Northern Europe. Wildlife protection and responsible resource usage lies at the very heart of Kolmården. And with Neutral® clothing, Kolmården has a platform communicating their sustainable mindset. A memory for visitors to bring home, exemplifying Kolmården's dedicated work towards the creation of a sensible balance between the planet and the people and animals living on it. Kolmården is a part of Parks and Resorts. An association of Swedish theme parks having more than 3 million guests every year with an annual turnover around 1 billion SEK. Besides Kolmården, we make T-shirts, hoodies, hats and bags for Gröna Lund, Skara Sommarland and Aquaria. Postevand has the aim of creating a more honest and sustainable approach to bottled water. Postevand (the Danish word for tap water) is Danish ground water, packaged in eco-friendly FSC cartons and always shipped over the shortest distance possibly. Equally a cause, statement and product, Postevand is encouraging people to drink tap water instead of buying bottled water whenever it’s possible. A message about sustainable water consumption shared through Neutral® products. Together with DFD - one of the largest service companies within industrial laundry - we have developed SELVFØLGELIG clothing for the health care sector. So now, the staff at hospitals and nursing homes can wear sustainable work wear that meet all quality requirements within industrial laundry when it comes to comfort, durability and price. Moreover, the worn out SELVFØLGELIG clothing is upcycled as new material in new products, prolonging the lifespan of each item. The concept of upcycled cotton has been developed by one of our long-term partners Klaus Samsøe - a true frontrunner within sustainability in fashion and design. Previously, he has conducted research on how to use cotton in new ways in non-clothing items together with the Technical University of Denmark (DTU). And now his valuable insight into materials' reusability has made it possible for us to reach new levels of sustainability. Thank you Klaus! 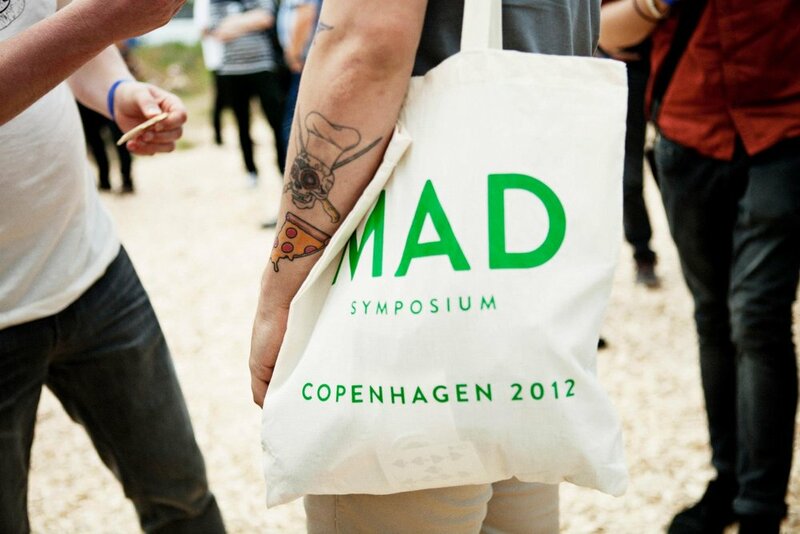 We have teamed up with NOMA to supply MAD T-shirts and bags to the MAD Symposium. MAD is the Danish word for food and since 2011 some of the world's best cheafs have gathered in Copenhagen to produce knowledge and share ideas on how the quest for a better meal can leave the world at a better place than we found it. Besides MAD T-shirts and bags, we also make Noma items for their openings around the world. Latest in Mexico, where Noma in April 2017 launched a tropical pop-restaurant in the jungle. The World's Best News is a campaign created by the UN, Danida and private sector as well as civil society representatives, that shares positive stories on global development. For their yearly pop-up event they use Neutral® clothing to communicate these messages to Danish citizens on their way to work. Many challenges still remain and many people are still in need. But The World's Best News shows us that progress is being made and that the effort matters. That's what we call an okay campaign!